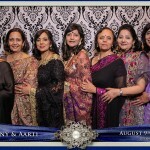 For us here at SDE Weddings, Toronto’s premier wedding videography, cinematography and photo-booth rental group, it’s always a pleasure in sights and sounds to experience a South Asian Pakistani wedding. From the gorgeous array of colours, vibrant textures, playful patterns and palettes, to the intricate designs and eclectic ambiance all throughout many multiple-days of celebrations, South Asian weddings make up among our favorite all-time works. So it’s no surprise that our videographers and cinematographers absolutely loved working with a very special couple, Saad & Anum, for their three-day gala wedding celebration extravaganza just this past August 2015, on the 12th, 14th and 16th respectively. From a traditional Mehndi ceremony for the first day, the Shaadi (or South Asian wedding) with a solemn Nikah ritual on the second, to a complete banquet and celebration (or Walima) to complete the wedding package for the third and final day. Through it all, our videographers and cinematographers shared with Saad & Anum many beautiful moments all captured through our lenses and made permanent in film. A special feature we included for Saad & Anum was a live feed of their wedding for the second and third days, broadcasting through Wi-Fi a crisp and clear feed of our camera footage for the projector screens in the banquet hall. 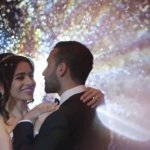 Scroll further and join us in reliving this wonderful wedding weekend, have a look at the highlight reel prepared by our videographers and cinematographers and learn more about the very special couple, Saad & Anum, on their truly special day. The first day, that of the Pakistani Mehndi ceremony, was truly a sight to see. And for our videographers and cinematographers behind the cameras, it couldn’t have been a better way to start off a three-day wedding weekend. Held at Mississauga’s Candles Banquet Hall on a Wednesday afternoon on August 12th, 2015, Saad & Anum were host to a colourful ceremony of song, dance and unbridled liveliness that filled the air and brought a truly magnificent start to the wedding ceremonies soon to come. The first part of our highlight reel captures a brief summary of such a joyful day, with sneak peeks of centerpiece dances and scenes of a truly happy family occasion that’s enough to warm anyone’s hearts. For the second day, which made up the apex of the wedding celebration for Saad & Anum, the beloved couple held their Pakistani wedding ceremony at Brampton’s Pearson Convention Centre, which makes this a first venue visit for our videographers and cinematographers. Beginning at the peak of the afternoon on Friday, August 14th, 2015 and lasting until midnight, this day constituted the Shaadi or Nikah ceremony – making it the official wedding ceremony day for Saad & Anum. Our videographers and cinematographers began by joining the beloved couple in their respective camps as they prepared for the long night ahead and the pivotal ceremonies which shall change their lives together. 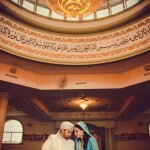 A favorite shot of ours, the moment-of-truth for Saad & Anum, of their ring exchange in a truly extravagant scene featured in our highlight reel. Overall, a very traditional and austere mood, a contrast to that of the first day; though altogether a jovial occasion all around. To conclude, we feature the final shot, of the newlyweds Saad & Anum leaving tougher in an ivory white Bentley aptly tagged “Just Married”, the same one Saad drove in with. A favorite of our videographers and cinematographers as a scene that truly encapsulated the day from start to end. For the third and final day on Sunday, August 16th, 2015, we joined the beloved couple Saad & Anum for pictures and video-taking at Vaughan’s Kortright Centre for Conservation. Dressed to suit a more casual and laid-back final celebration to mark the beginning of their lives together as husband & wife, we featured the two in a very special scene that is an absolute favorite of our videographers and cinematographers. 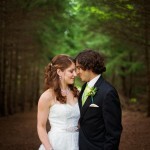 A truly magical shot of the newlyweds sharing a passionate moment under the sunset, alone amidst an empty forest. A scene like that truly makes our jobs here at SDE Weddings worthwhile! And to conclude the three-day Pakistani wedding ceremony and celebration, we feature footage of the evening’s festivities at a favorite venue of ours, Chateau Le Jardin; a complete cake-cutting with the family and plenty of song and dance to segue to the end of an absolutely unforgettable wedding experience. In short, we here at SDE Weddings, Toronto’s premier wedding videography, cinematography and photo-booth rental group, wish Saad & Anum all the very best in their new life together, and hope that our work with them on their magical three-day wedding celebration lives on in their lives as a token of many truly unforgettable memories. 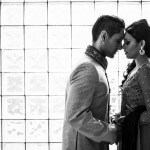 Mehndi ceremony: Candles Banquet Hall | 1224 Dundas St. E.